Breakfast Biryanis And Biryani Walks: Are You Part Of This Cool Facebook Group That's Dedicated To Biryanis? If biryani is bae, then we have found you a group on Facebook that's dedicated everything biryani. From breakfast biryanis to decoding the science behind donne biryanis, Bengaluru Biryani Club is your group! Talk about the love for biryani escalating so quickly that you call up your friends and start a biryani club overnight. Well, that’s exactly what Renukesh Bingeri, Navneeth Thimmappa, and Vinay Nagaraju did. And that’s how Bengaluru Biryani Club came into existence. And boy, aren’t we glad. To put it in layman terms, the Bengaluru Biryani Club is that one Facebook Group that you need to be a part of if you love biryanis and can tell the difference between a donne and a dum. Apart from members posting pictures of the biryani they eat on a daily basis and a discussion around it, the group is all about uniting the donnes and the dums, the Hyberbadi with Thalassery, and the Ambur to the Awadhi for biryani lovers. But the best thing the group does? Biryani walks! 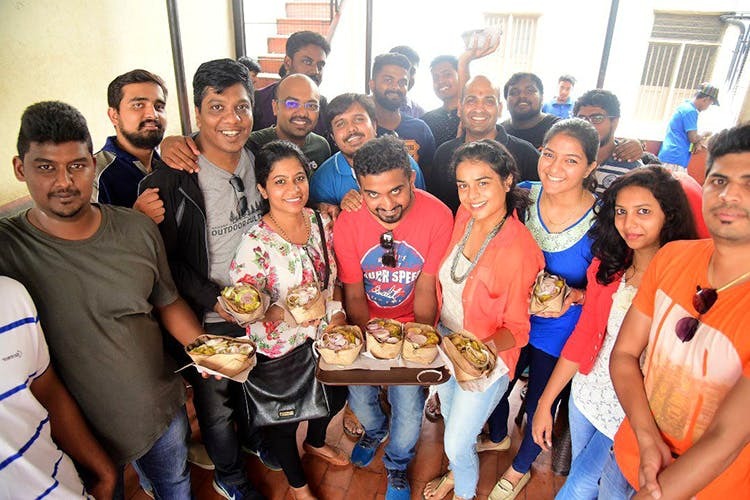 Oh yes, from your not-so-famous biryani spots to the legendary ones, this group is about following one’s tummy and sniffing out that drool-worthy aroma of all biryani places. Remember that breakfast biryani recommendation we had written about? They had an event there, then at Shivaji Military Hotel, and even at SGS Gundu Pulao! The SGS one was about discovering what it is to feast on an authentic donne biryani. You'll need to join the group to keep yourself update on their walks! We have already joined the group. Have you? If not, just send a request to join Bengaluru Biryani Club and one of the admins will add you to the 15,000+ strong club.